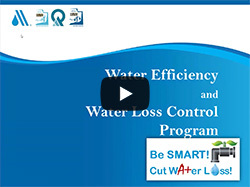 Every month, Drinking Water is live with a topic that is important to drinking water professionals. We invite speakers to present about their area of expertise. Watching these 30-minute videos can get you .05 CEUs if you fill out the corresponding form. Follow us on Youtube to get notifications of when we go LIVE. Scroll down to see past videos. March 25, 2019: A review of seasonal start up procedures and chemical sampling. 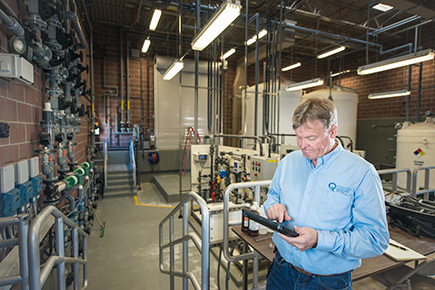 If your water system is seasonal, or your system has chemical sampling requirements then March is a good time to review those requirements with DDW staff. 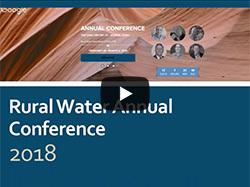 February 4, 2019: See what’s in store for Rural Water’s 2019 Conference. 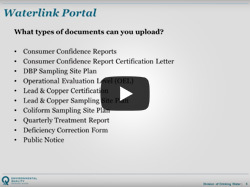 January 28, 2019: How to upload documents to Waterlink for your particular system. Operators now have the ability to access the Waterlink Portal which allows upload and tracking of documentation you need tracked and approved by DDW. 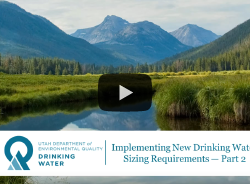 November 20, 2018: Join us for Part 2 with Utah DDW Deputy Director Ying-Ying Macauley presenting more detail on how the Division will implement the new system specific sizing requirements. 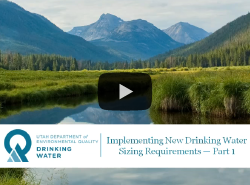 November 20, 2018: This month the Division of Drinking Water Webinar has Ying-Ying Macauley presenting more detail on how the Division will implement the new system specific sizing requirements. September 24th, 2018: This webinar explains the difference between reporting violations and monitoring violations and how water systems can prevent getting these avoidable IPS points. 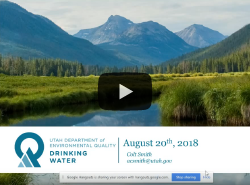 August 20th, 2018: Alane Boyd of the Intermountain Section American Water Works Association highlights their upcoming conference. 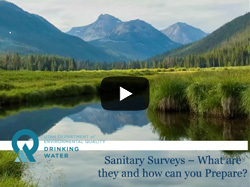 July 25, 2018: Patti Fauver explains the sanitary survey process and how water systems can prepare for upcoming surveys. 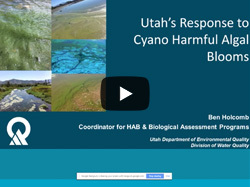 June 20, 2018: Michelle Deras with Division of Drinking Water and Ben Holcomb with the Division of Water Quality discuss how the two agencies address harmful algal blooms in Utah. May 30, 2018: Division of Drinking Water scientist Ryan Dearing presents on the risks of batch chlorination and when intermittent chlorination is appropriate. 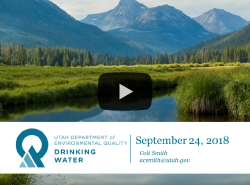 April 30, 2018: Hear from Weber Basin Water Conservancy District and Lehi City on their experiences using the AWWA Water Audit Method to account for drinking water and irrigation water. March 26, 2018: Assistant Division of Drinking Water Director Ying-Ying Macauley explains how H.B. 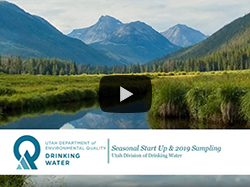 303 will impact public drinking water systems in Utah. 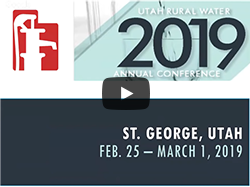 February 12, 2018: Shannon Rasmussen, Utah Rural Water Association, reviews the exciting events and seminars scheduled for the Rural Water Conference. 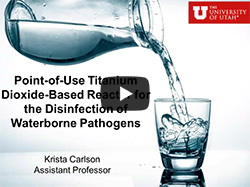 January 29, 2018: Dr. Krista Carlson, a professor at the University of Utah, presents her water treatment research.